Sometimes you just really want a burrito but you may not want to eat the 800+ calories that usually come with a burrito. Burritos are normally made with a ton of rice, cheese, and well, wrapped in a flour tortilla. This Recipe is a great way to still get all of that flavor but in a Paleo-friendly way. 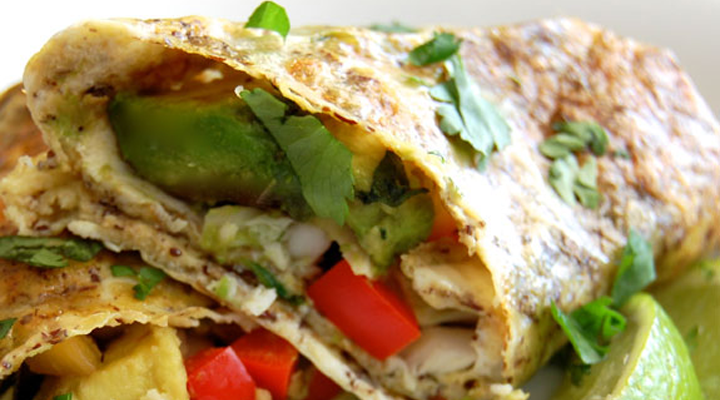 This breakfast burrito made with egg and flaxseed is perfect for a tasty, filling morning meal. Step 1: In a small bowl, whisk together the ingredients for the tortilla. Preheat the oven broiler. Step 2: Heat a 10-inch non-stick skillet over medium heat and coat well with coconut oil spray. Pour half of the tortilla mixture into the pan and swirl to evenly distribute. Using a metal spatula, loosen the edges of the tortilla from the pan. Cook a couple of minutes until golden brown on the bottom, and then carefully slide the spatula under the tortilla to loosen it from the bottom of the pan. Do not flip yet. Step3: Place the pan under the broiler for 3-4 minutes until the tortilla gets a little bubbly. Remove the tortilla from the pan, setting on a piece of aluminum foil. Repeat with other half of tortilla mixture. Step 4: After the tortillas are done broiling, preheat the oven to 400 degrees F. In a separate small pan, heat the coconut oil over medium heat. Add the onions and peppers and sauté for 5-8 minutes, until soft. Add the spinach into the pan and wilt. Step 5: Place all of the fillings down the center of the tortillas and wrap tightly. Place into the oven for 5-8 minutes to set the shape of the tortilla. Enjoy!